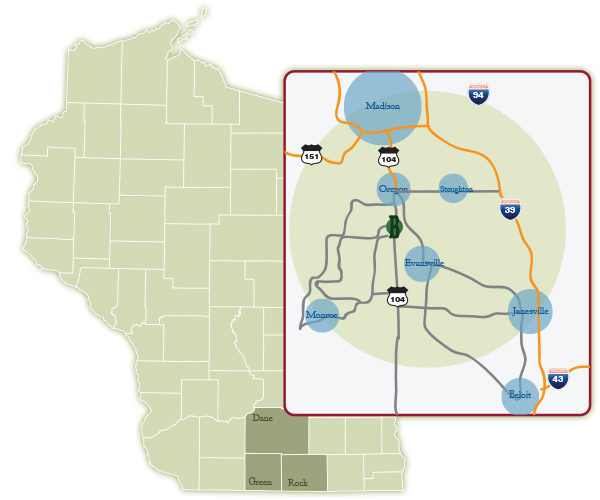 Located on the boarder of Dane and Green counties, one mile off Highway 14, Brooklyn is between Madison (17 miles) and Janesville (23 miles), providing residents with the opportunity to enjoy the shopping, employment and culture of both cities as well as the surrounding southern Wisconsin communities. Our neighborly village has excellent amenities: a strong school system; a Village community center for social, meetings and gym use; large developed Village parks and a small town atmosphere that makes urban and rural minded people feel at home. The Economic Development Committee is interested in partnering with prospective commercial companies who wish to explore available sites in the Village of Brooklyn or development of our Brooklyn Business Complex. Educated Hard Working Human Resources: According to the 2010 census, the Village of Brooklyn had the highest population growth in Dane county with an increase in young professionals from Madison or Janesville. Village of Brooklyn Community Profile provides additional details about this growing community . The Economic Development Committee wants to help existing and new businesses by providing resources.